I love sharing my passion for kayak fishing with anyone who wants to listen. I guess that is a big part of blogging - sharing what you love. I've talked to a number of different groups and organizations before, but when I got the opportunity to speak at the LL Bean Spring Fishing Expo, I was beyond excited...and a little nervous. L.L. Bean is an outdoor powerhouse and their flagship store/campus, in Freeport, Maine, is very impressive. The opportunity came via Wilderness Systems, one of the major kayak brands that L.L. Bean carries. To top it off, I was also following in the footsteps of longtime Wildy pro Jeff Little, an uber talented angler who was the speaker last year, and talking before some of the best fly fishers in the country. No pressure, right? After much debate, I decided to go old school - no PowerPoint, no video, and no frills. It was just me, some notes, and a fully rigged kayak. This decision may have been influenced by my dislike of PowerPoint, which began in grad school, where the amazing software is abused to create hour long snoozefests, deemed "lectures". My attendance record at those classes and talks may have been less than stellar. The last thing I wanted was a bored audience. In hindsight, this was a fantastic choice. Some are probably asking, "really"? Really. I do think a video would have been cool, in fact I will probably make one this year, and maybe I should have included a picture or two. But in my opinion, seminars are not about self promotion, which I believe happens much too often. 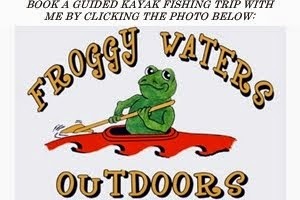 They are about promoting kayak fishing and should motivate folks to want to get involved in the sport. Some guys, like Jeff, make you want to buy a kayak right then and there. That was my goal. I won't lie, when someone spends money putting your name on signs and in brochures, it adds a little pressure. The talk was titled Kayak Fishing 101, with a focus on fly fishing, since the majority of L.L. Bean's customers are fly anglers. Each morning, I talked at length about kayaking safety, getting started, different accessories, fly fishing techniques specific to kayakers, and a variety of other things - mixing in stories and humor to keep the mood light and show how much fun kayak fishing can be. The first talk was standing room only. The second wasn't as full, but was still a pretty big crowd. Based on the reactions after each talk and throughout the weekend, I think it was a hit. Wildy sales rep Courtney Moore, who was an amazing partner in crime, and I talked to a continuous flow of people throughout the weekend. A lot of people were interested in leaving with a kayak, while others wanted to wait and a try a boat before they bought it, which we both recommended. On that note, I believe that L.L. Bean is hosting a paddling demo and promo weekend in late April, so if you are in the market for a boat, keep an eye out. In addition to boats, I was able to show off a variety of accessories from YakAttack and Harmony and my Bending Branches paddle. My confidence was a lot higher on day 2 than it was on day 1. I guess that is only natural. It also helped to receive kind words from so many members of the audience, Courtney, and Mary May. The biggest compliment of all came toward the end of the show, when the seminar coordinator/introducer thanked me, told me how much he enjoyed the talk, and said that he would be recommending that L.L. Bean invite me back to speak again later this year. The goofy smile on my face said it all. I also have to say how amazing the L.L. Bean staff was. Every single person I met blew me away with their friendliness and helpfulness throughout the weekend. It is easy to see why they are renowned for their customer service. After wrapping up the weekend, we headed to a local restaurant to chow on some seafood, because what is a trip to the Maine cost without a lobster roll! I talk a lot on this blog about learning from your mistakes and using them to grow as a person. Although I count the weekend as a major success, there were parts of my talk which I have already changed, and I learned a lot about effective approaches for selling boats and accessories. In fact, it even gave me some ideas about how I could become a better blogger and representative of the sport. Hopefully, I can use what I learned and make my next seminar, sales weekend, or blog even better. Now if this ice would melt so I could hit the water! Until then, it is back to clearing our house lot and getting that project moving at full speed. Is that you, spring?